A female aged 2 years was brought by her parents with complaints of severe cough with breathing difficulty with high fever since 8 days. Child had vomiting as soon as taking food and drinks. 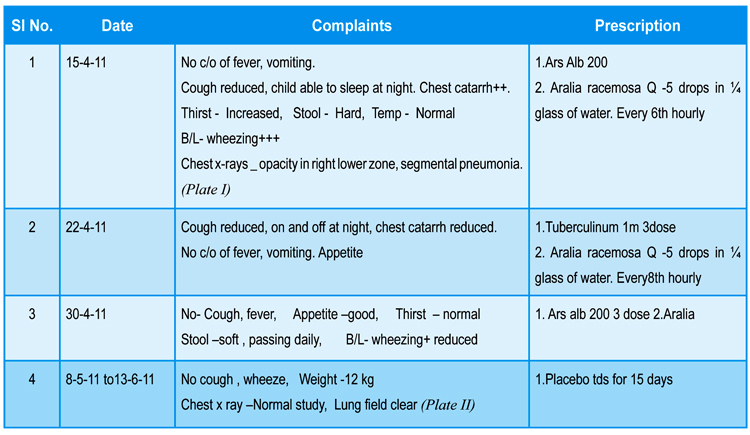 Cough mainly during midnight 10 to 11pm to 2am, child afraid to lying down at night due cough with suffocation. 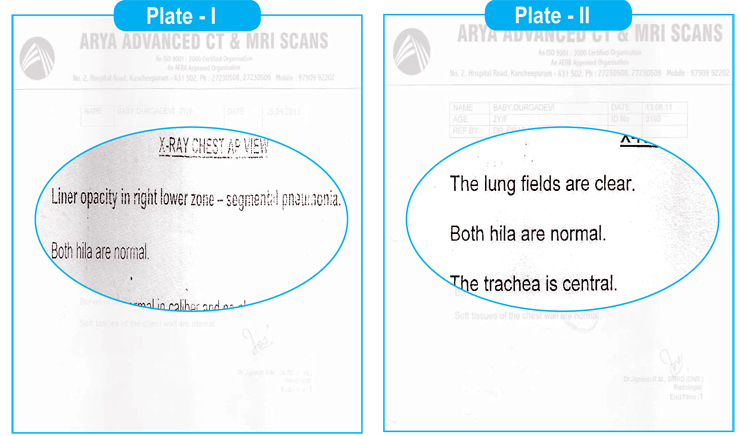 Expectoration scanty with thick white and chest catarrh . Cough better while sitting and taking warm drinks. Child suffering from frequent cold, cough, fever since birth; past six month complaints increased on and off for which allopathic treatment was taken. Nothing significant in family history. Patient admitted in kanchipuram government hospital on 8-4-11 for fever, cough, wheezing, and vomiting. As there is no improvement, doctor advised her to admit in egmore children hospital. • Thirst – Increased, frequent interval. 2. Aralia racemosa Q -5 drops in ¼ glass of water. Both Every 4th hourly. Ars alb and aralia racemosa Q selected based on the symptom similarity. Tuberculinum gave inter current dose in apyretic stage. Tuerculinum best effective in strepto, staphylo and pneumococcal infection. Patient was recovered completely with similimum and the support of intercurrent.